Regular extinguishers contain a siliconized sodium bicarbonate based dry chemical with free flowing and non-caking additives. Economical Class B & C protection with lower initial cost and recharging. This chemical smothers fires in flammable liquids and pressurized gases and is electrically nonconductive. 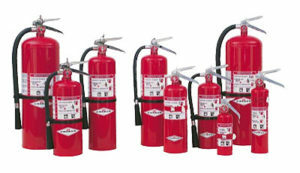 Available in a variety of types and sizes of Wheeled and stationary extinguishers.